NASA made an exciting discovery this past Thursday. According to the agency, the NASA rover Curiosity found organic matter in soil samples obtained at the bottom of a large crater on Mars. Organic molecules like the ones discovered are precursors for life as we know it, and though the compounds can occur without life, they could foretell the discovery of life on the planet. The Curiosity rover has detected organic molecules in samples drilled out of an ancient lake bed. The rover drilled into the mudstone of the lake bed and then heated up the samples in its onboard oven. When the mudstone samples hit around 500 C to 800 C, the sensors on the rover reported the presence of thiophenic and aliphatic vapors. The researchers believe these compounds to be what are left over when more complex organic molecules break down. According to Kirsten Siebach, a planetary geologist at Rice University in Houston (not involved with the study), the organic matter detected by the rover was likely preserved in the rocks for upwards of 3 billion years. The carbon-based compounds that the rover detected are the best evidence yet the red planet once held life. Organic matter can be either a record that life once existed in an area or a source of food for developing lifeforms. The findings were detailed in two studies published in the journal Science on Thursday, and the researchers in charge of the study believe it to be a substantial breakthrough in the science of astrobiology – the search for life in outer space. Previous studies have detected smaller samples of methane in the atmosphere as well as ancient organic compounds, but without more data, it was difficult to interpret the findings. The recent findings from Curiosity give some context to the previous research and suggest that billions of years ago Mars may have been much more amenable to the possibility of life. The research team was careful to make clear that the organic compounds aren’t necessarily evidence of life. The research team is, as of yet, unable to determine how the compounds formed and found their way into the Martian soil. While the compounds could have been left by past life, they could also be the result of chemical reactions occurring within the rocks or brought to the planet by a comet. Despite this, the research team remains excited about the discovery. At the very least, the presence of the compounds means that if life did evolve on Mars it would have had organic compounds to sustain it. “We know that on Earth microorganisms eat all sorts of organics. It’s a valuable food source for them,” explains biogeochemist at NASA’s Goddard Space Flight Center, Jennifer Eigenbrode. Ashwin Vasavada, project scientist for the Curiosity rover at NASA’s Jet Propulsion Laboratory, also expressed excitement at the find and says that if life was ever present on Mars, the chances of finding it “just went up”. 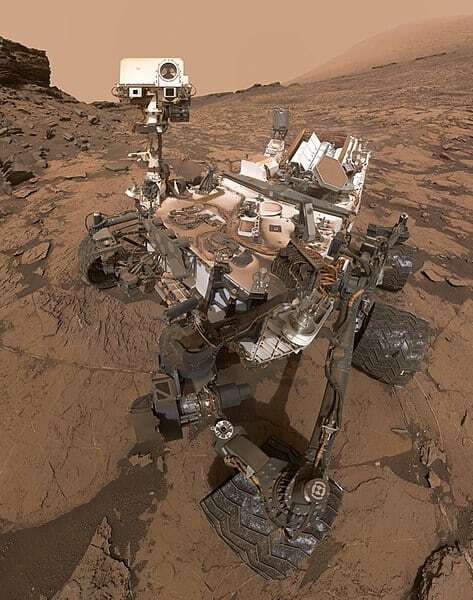 Along with the detection of the carbon compounds, since the Curiosity rover landed in 2014 it has also detected traces of methane in the planet’s atmosphere. Methane is typically considered to be the most basic organic molecule, and it is found in other places that scientists suspect could support life in our solar system, like the moons of Saturn and Jupiter: Enceladus, Europa, and Titan. The studies built upon the detection of methane in the atmosphere and the ancient organic compounds. While the carbon compounds found in the lake bed sample have probably lain dormant in the soil for millions of years, these organic methane compounds exist in the Martian atmosphere today. The fact that methane is currently present on Mars is somewhat puzzling since methane dissipates after only a few hundred years. This means that there’s something on Mars continually pumping out Methane. A study published in 2009 reported that plumes of thousands of tons of methane would occasionally jet out off the ground. 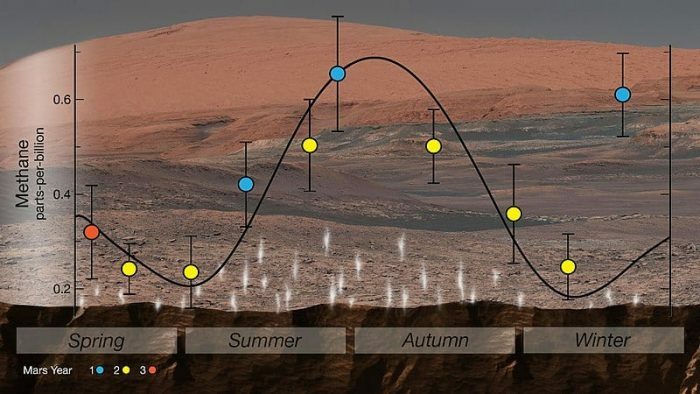 It’s possible that the source of the methane is deep under the ground and the temperature fluctuations that Mars experiences between its winter and summer seasons force the methane to the surface. While this is a possible explanation for how the plumes of methane reach the surface, the origin of the methane is still unknown. Combined, the findings of both the methane and the ancient organic compounds suggest that Mars may have once been suitable for life. Furthermore, the context provided from Curiosity’s findings mean that the planet isn’t necessarily the dead planet it was long thought to be. Caltech planetary scientist Bethany Ehlmann (not involved with the studies) explains that “it shows that Mars is an active planet today”. Mars could be right on the edge of habitability, explains Ehlmann. While the current findings from Curiosity have proven valuable and exciting, much more investigation will be needed to determine if Mars once possessed (or may still possess) life. NASA will need to send research equipment capable of making more refined measurements of gas methane gas levels. Life on Earth typically creates more methane and less ethane than non-organic reactions. If these telltale signs were witnessed on Mars it would increase the likelihood that life was on the planet. It will also be important to dig deeper into the Martian soil. The fact that rocks located just centimeters beneath the Martian surface contained organic material raises the question of what other compounds could be found deeper into the surface. The location of fatty acid compounds, for instance, deeper underground would strongly hint at the presence of life. NASA and other space agencies are already gearing up for more missions to Mars. The European Space Agency will have its ExoMars spacecraft land sometime in 2020, and the craft will have the ability to drill over six feet down into the soil. The ExoMars mission is already providing the ESA with valuable data on Mars, as the mission’s Trace Gas Orbiter arrived in 2016 and has been collecting data that will help scientists map out Mars’ methane deposits. Meanwhile, NASA’s InSight Lander will touch down on Mars on November 26th of this year. The rover’s goal is to explore Mars and determine if the planet is geologically active, including if the planet has “Marsquakes”. Previous Post« Previous What Do Fish Eat: Let’s Find Out!